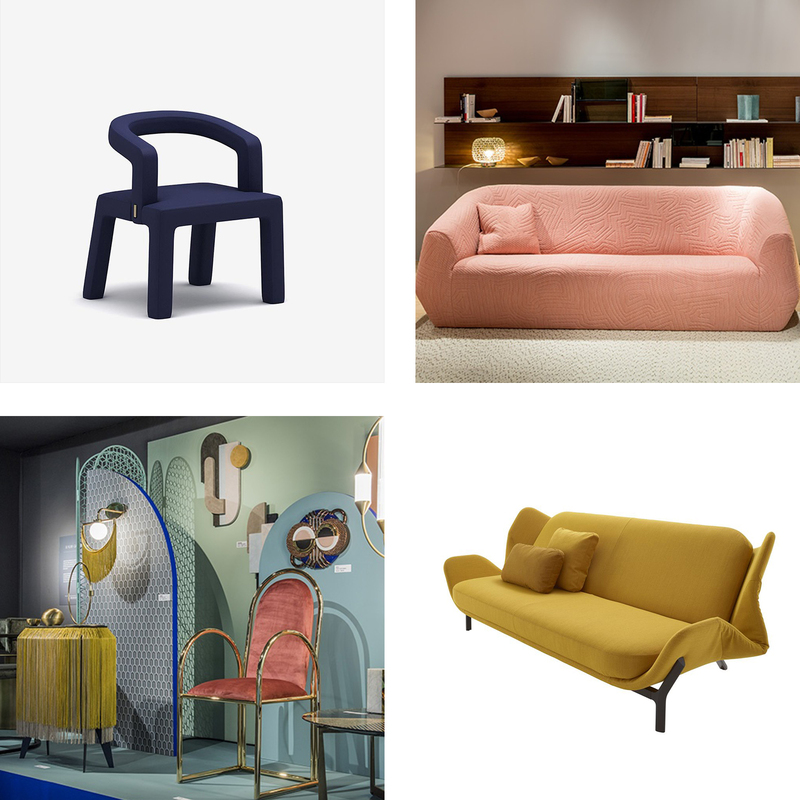 At Maison & Objet in Paris last month over 600 new brands exhibited, with an updated event format separating the show into distinct categories for objects and accessories, and home interiors. Needless to say, the new designs featured did not disappoint. We found ourselves inspired by textures and shapes to elevate any space, including unexpected whimsical details, plush textiles, and many nods to the Art Deco era. We were delighted to see many of these trends represented in several recent KBFA projects and artists’ work. 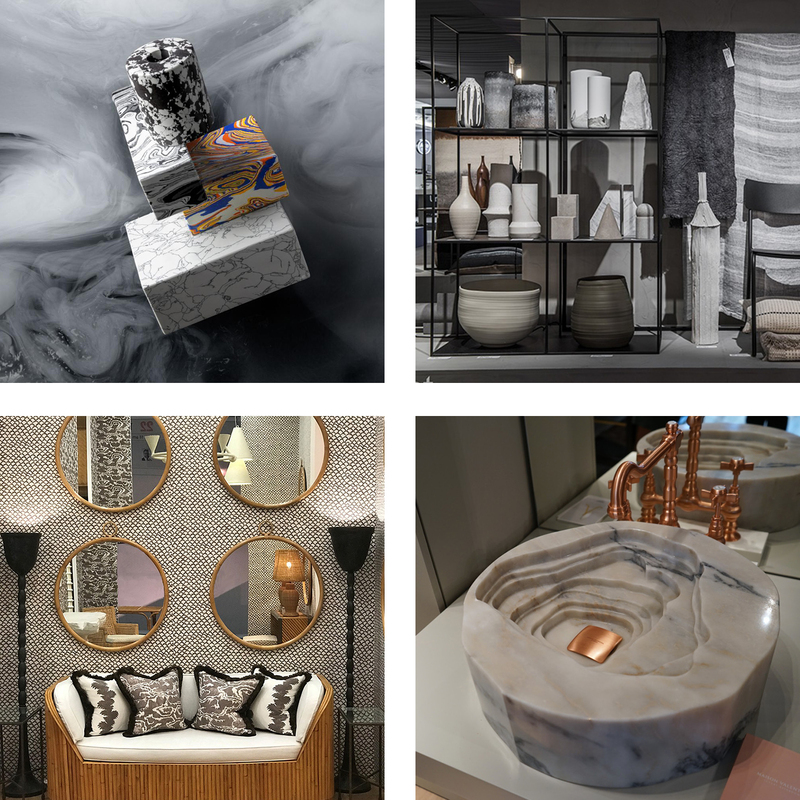 Join us in poring over four of our favorite trends from Maison & Objet: Geometric shapes, natural materials, plush art deco and heavy metals, along with KBFA artists’ work and completed projects pulling from these themes. 1. ‘118 Chair’ for Thonet by Designer of the Year Sebastian Herkner. Photography by AETHION. 2. ‘Monaco’ customizable suspension lights by UTU Soulful Lighting. 3. ‘View Bowl’ by glass manufacturing & design powerhouse SkLO – a two-part vessel consisting of a cylindrical base supporting a round bowl. Photography courtesy of SkLO. 4. Maison & Objet star Sebastian Herkner was also the artist behind the new ‘Echino’ side tables (with blown glass legs!) for Italian brand Zanotta. 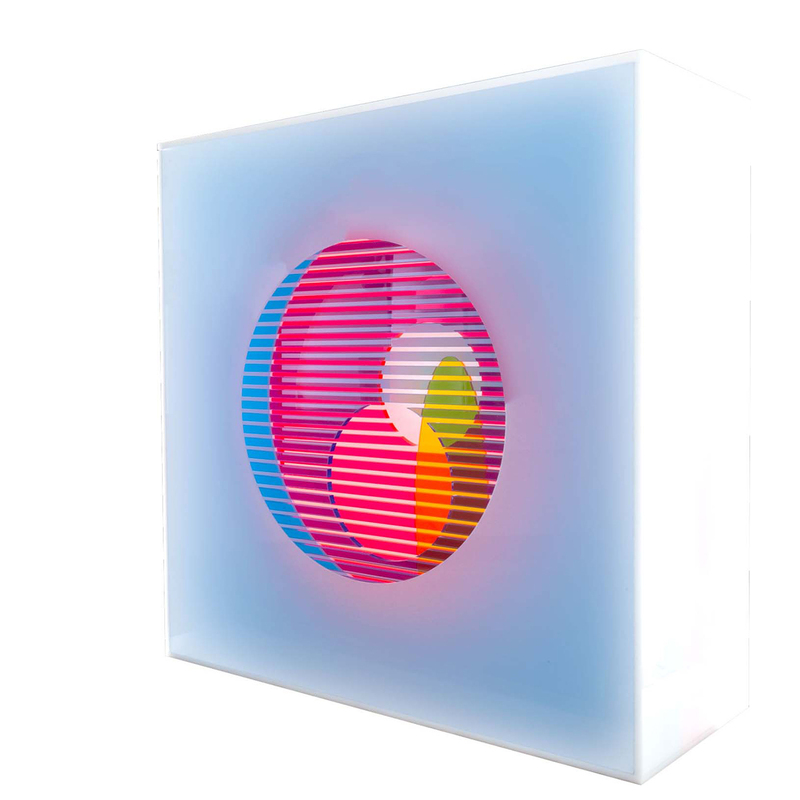 Los Angeles based KBFA artist Nicholas Biddle is no stranger to pushing creative boundaries with geometric shapes – using urethane, lucite, concretes and plastics. He works to bring serenity and emotion to the viewer using familiar natural shapes with enhanced color while juxtaposing them by using synthetic materials. Check out more of Nicholas’s work here. 1. The ‘Swirl’ by Tom Dixon family of bookends, vases and candleholders were crafted to resemble 3D marbled paper, yet created with resin, pigment and recycled material from the marble industry. 2. The curated Minimal Brutalist theme of Elizabeth Leriche’s exhibition What’s New. Photography by AETHION. 3. Marble vessel sink by Maison Valentina – drawing inspiration from Duoro Valley’s fields in Portugal. Photo by Cullen Fairchild. 4. Kuta Bamboo Mirror, Flores Bamboo Sofa and Roche Wallpaper in the color Elephant by Paolo Moschino for Nicholas Haslam. Photography courtesy of Nicholas Haslam. 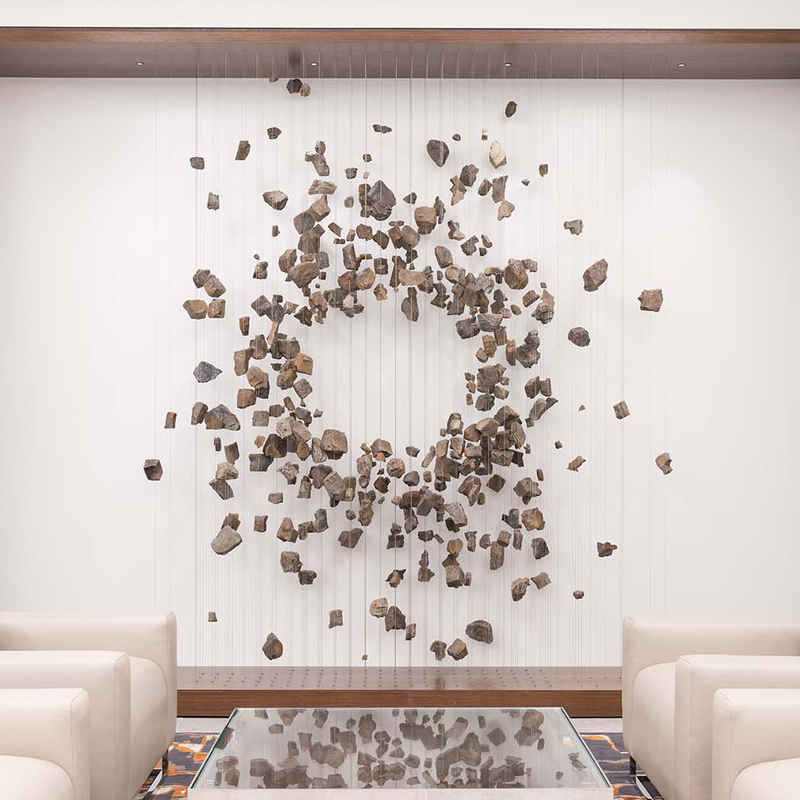 In this corporate art consulting project by KBFA, artist Chris Nelke created a fragmented, floating stone sculpture for a corporate building lobby near Houston, TX. The sculpture is crafted out of stones sourced from a geological dig performed in the area, mounted on aircraft cables and arranged in a dynamic, yet natural-looking formation. See more photos from the completed project here. 1. The ‘Middle Chair’ by Frank Chou was inspired by traditional Chinese bamboo chairs with metal armrest accents. 2. Ligne Roset’s ‘Uncover’ sofa – the low-key ‘cousin’ of designer Marie Christine Dorner’s cult favorite ‘Cover’ sofa. Photography courtesy of Ligne Roset. 3. ‘Clam’ daybed sofa by Ligne Roset – this clever design converts from sofa to daybed with a click, and then again to a double-bed. Photo courtesy of Tom Dixon. 4. The ‘Luxury Graphic’ theme from the What’s New installation showcased rich, deep hues with pieces hand-selected by Elizabeth Leriche. Photography by AETHION. 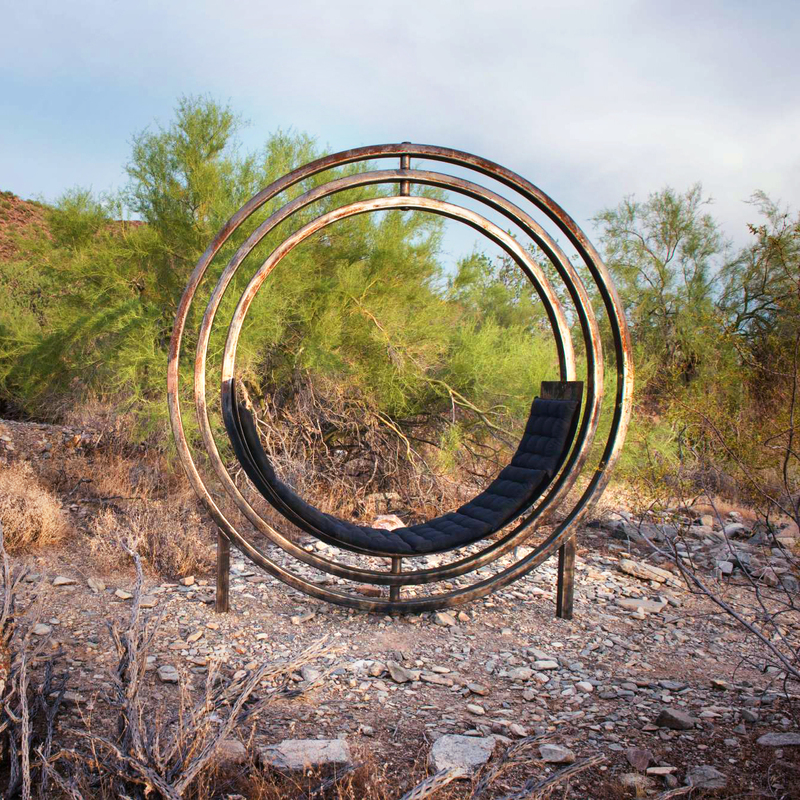 ‘Etazin’ interactive outdoor lounge chair and sculpture piece by KBFA artist Kathleen Werner. Kathleen completed a program at the Frank Lloyd Wright School of Architecture and is inspired by the idea of creating interactive art; large pieces that can be both beautiful and useful, and enhance landscaping or living areas while embracing true function. ‘Etazin’ is on permanent installation at Taliesin West. View more of Kathleen Werner’s work here. 1. ‘Serie 01’ by Pool and Atelier François Pouenat at Gallery Joyce. ‘Serie 01’ contains eight pieces by Fredrick Paulsen, Paul Loebach, Pool and Fabien Cappello – all of which are created out of steel, brass, aluminum and other metals. 2. Terracotta Coated Copper Family by Indian brand Ikkis. 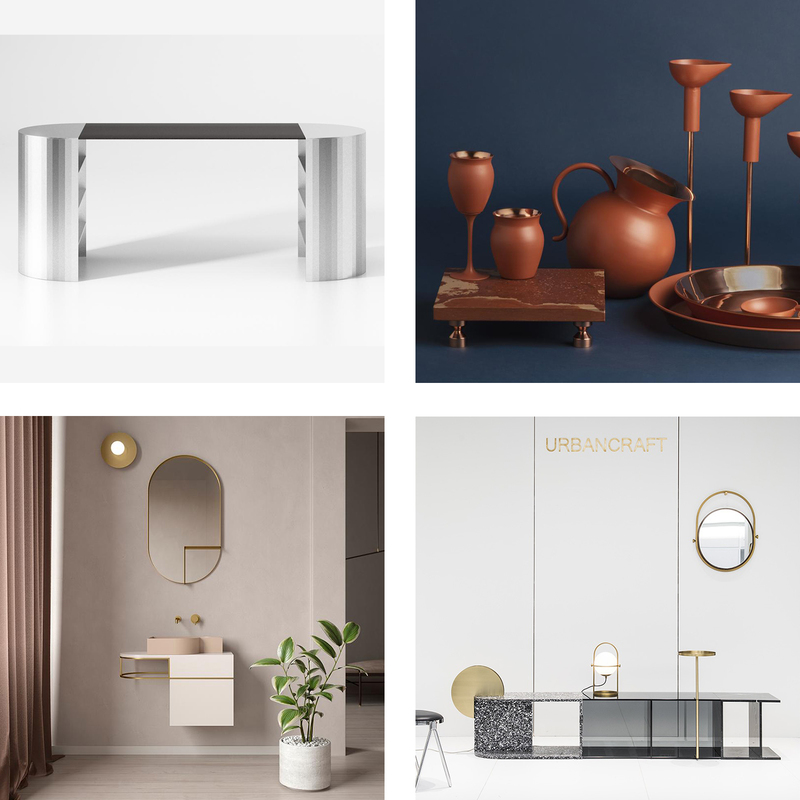 Founder and creative director Gunjan Gupta launched Ikkis at Maison et Objet with a series of 21 objects (Ikkis means ’21’ in Hindi) using materials such as terracotta coated stone, glass, and copper. 3. 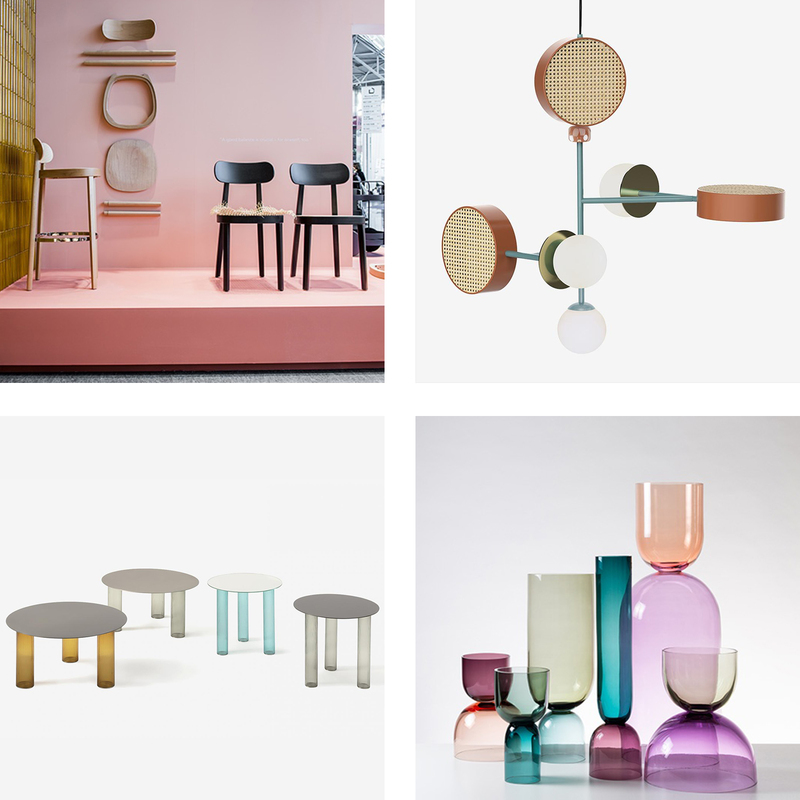 Maison & Objet Rising Talent Awards winner Ximi Li’s Urbancraft furniture. Photography by AETHION. 4. Nouveau’ by Milan-based studio Bernhardt-Vella for Ex.t Florentine bathroom brand took inspiration from early 20th-century art deco, using brass adornments to finish a simple and chic bathroom set. At the heart of our Nation’s capital, our artists helped create an inviting and sophisticated welcome for guests with a luxurious use of gold mosaic and marble for the front reception desk at the Fairmont, Washington D.C.
Our art consultants are currently working to incorporate these trends (and many more) found at Maison et Objet, and would love to help weave whimsical art deco designs, geometric shapes, pastels, metals or chic natural materials into your next design project. To get started or find out more about working with our consultants and artists, click the button below!